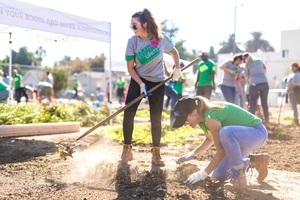 Thursday, November 1, 2018, Los Angeles, CA—Volunteers from Timberland, Journeys and the Student Conservation Association transform a vacant lot in Little Green Acres Park into a thriving community garden for local residents. STRATHAM, N.H., Nov. 05 /CSRwire/ - Known worldwide for its outdoor heritage and environmental responsibility, Timberland has a longstanding commitment to protect and restore the outdoors. Not only the great outdoors, but the city parks, community gardens and green spaces people explore every day. In 2016, Timberland made a public commitment to create or restore green spaces in five U.S. cities over five years, equivalent to or greater than the brand’s retail footprint in those cities. With the completion of three urban greening events this fall, Timberland has met its commitment two years ahead of schedule – greening a total of 130,000 square feet of space, far beyond its retail footprint in those cities. Today, the brand re-set the calendar and is upping the ante with a new goal. Over the next five years, Timberland has pledged to create or restore at least 500,000 square feet of green space in cities across the U.S. – equivalent to 11 acres and nearly four times the amount of urban space greened through its most recent effort. This fall, Timberland partnered with the Student Conservation Association (SCA) and Journeys on urban greening events in three U.S. cities. On September 27, roughly 75 volunteers gathered in Chicago to transform the Blue Island Corridor in Ward 25 into an instant park for the community. On October 17, 150+ volunteers joined forces in New York City to restore a rooftop greenhouse, construct an outdoor classroom and create a living roof at the Manhattan Center for Science and Mathematics in East Harlem. And this past Thursday, November 1, 100 volunteers teamed up in Los Angeles to create an urban farm in Little Green Acres Park, and provide access to fresh, healthy produce for local residents. Timberland launched its urban greening initiative in 2016 in New York City, revitalizing an abandoned community garden in the Bronx. In 2017, the brand partnered with the Center City District Foundation in Philadelphia to help transform a portion of abandoned elevated tracks from the Reading Railroad into a new public green space for the city. Timberland’s greening efforts are not limited to the United States. The company has a robust global tree planting commitment, with 9.6 million trees planted to date – everywhere from the Haiti and the DR to China’s Horqin Desert -- and a goal to reach 10 million by 2020. In Europe, Timberland has teamed up with the King Baudouin Foundation to support the creation, maintenance or improvement of greenspaces in five European cities in five years through a grant program called My PlayGreen. To learn more about Timberland’s commitments to make products responsibly, protect the outdoors and serve communities around the globe, visit timberland.com/responsibility. Timberland is a global leader in the design, manufacturing and marketing of premium footwear, apparel and accessories for the outdoor lifestyle. Best known for its original yellow boot introduced in 1973, Timberland today outfits consumers from toe-to-head, with versatile collections that reflect the brand’s rich heritage of craftsmanship, function and style. Timberland markets lifestyle products under the Timberland® and Timberland Boot Company® brands, and industrial footwear and workwear under the Timberland PRO® brand. Its products are sold throughout the world in leading department and specialty stores as well as company-owned retail locations and online. Timberland’s dedication to making quality products is matched by an unwavering commitment to environmental and social responsibility – to make it better with respect to responsible products, protecting and restoring the outdoors, and supporting communities around the globe. To learn more about Timberland, a brand of VF Corporation (NYSE: VFC), please visit timberland.com or follow us @timberland.